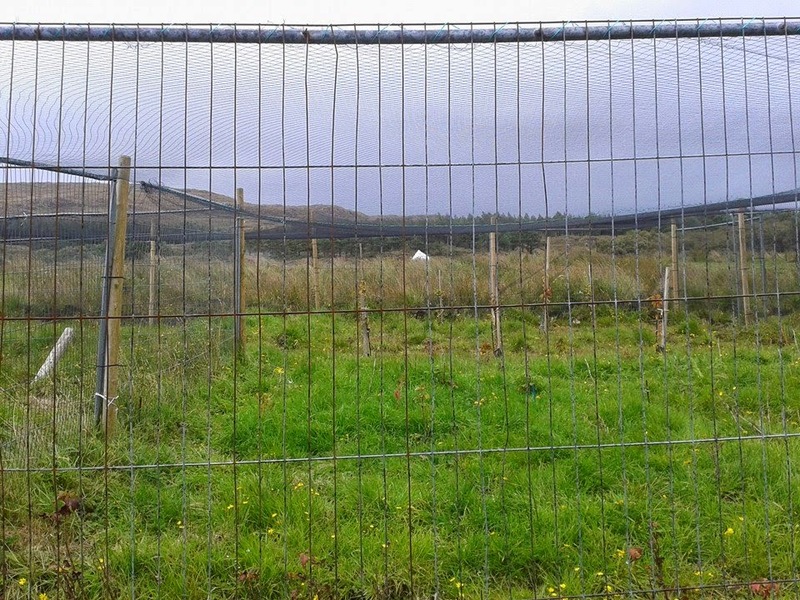 The masterplan to build a nissen hut this year has not come to fruition. This has not been the only part of this years plans which has not quite panned out. However, the measure of a person is not whether they make all their plans work out, but how they adapt and react when their plans go awry. So here we are adapting, rethinking and making new plans. 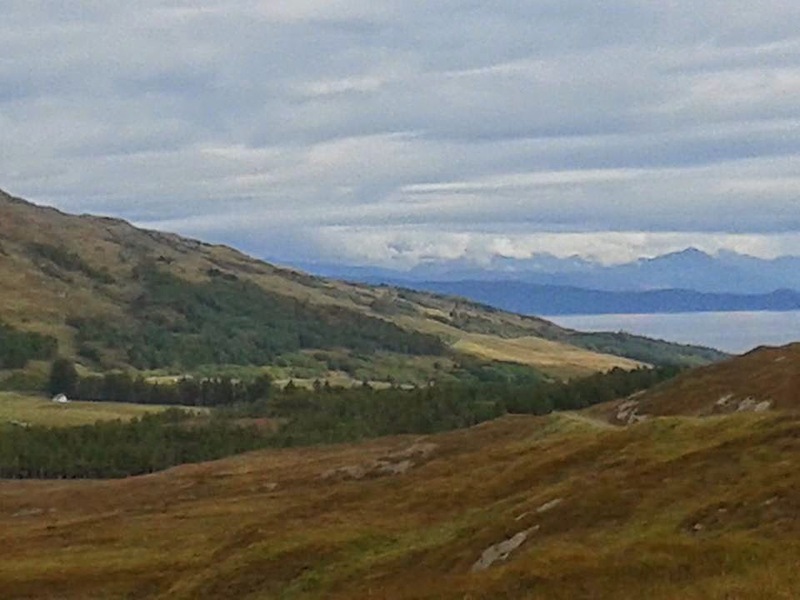 This year we have learned even more about the best possible location to build on our croft. We have acquired plenty of new skills in a building method which perfectly meets our needs – low impact, green, using very local materials, creating opportunities to learn and offer others the chance to learn alongside us, cheap, sustainable, within our reach. 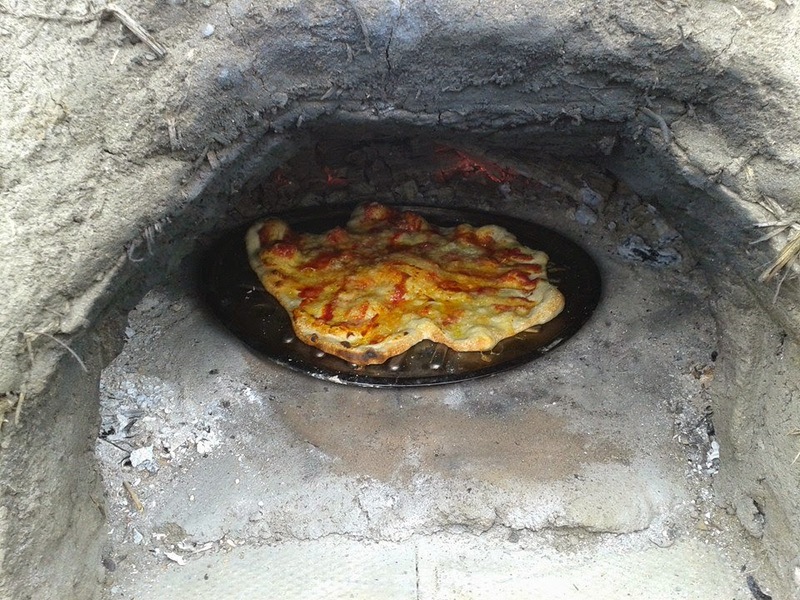 We have spent the last few weeks practising and testing with our small scale build of a pizza oven and we can now spend the winter observing how that copes with the Rum climate and conditions. We have also had hours of discussions, stacks of research, plenty of reading and lots of sketches and agreed on a design that all four of us are delighted with. We have done some really interesting exercises based on some of the self build books we have about how you use the space you live in and thought really hard about what works for us in the various spaces and places we have lived and stayed and worked in, including our static, our campervan, various homes we have lived in and visited. We have created lists of essential and desireable features, thought about our relationship with indoor and outdoor and bridging the two, functions of different areas and what works specifically for the four of us – the people who have to live and work in a space. We mapped out patterns of our days, times we are all together, times we are apart, worked out where the sun rises and sets in relation to our activities, which spaces need to feel cosy and be easy to keep warm, which need to feel light and airy and spacious. Places to snuggle up, places to spread out, places to relax, places to get privacy, places to be sociable. We talked about the sort of quirky, specific to us areas we need – somewhere for Bonnie’s dog crate (not too far from the front door so she can be put straight in there if she comes in to the house wet or muddy), the Christmas tree (it is up for approx. 1/12 of the year so deserves a logical space rather than being simply in the way for a whole month every year), Ady to have his morning coffee, me to have my hour or so after everyone else has gone to bed. How we don’t want the bath in with the loo, how open plan works well for us so the person cooking is still hanging out with the rest of the family in the evening, how we want the oven close enough to the table that I can nip across to check the bread I almost always cook after our dinner is served. How the radio needs to be kept near a window to get signal and we need to gather round it for Popmaster every weekday morning. This will be our space and it needs to feel as comfortable and tailor made as the perfect pair of boots. So, we have our design. We have our location. We have our test model. Next we need to start working out timescales and putting together a masterplan as to how it will all work, when it needs to happen and what order everything will go in. I love it when a plan comes together. Or falls apart totally and gets superceded by a brand new plan! 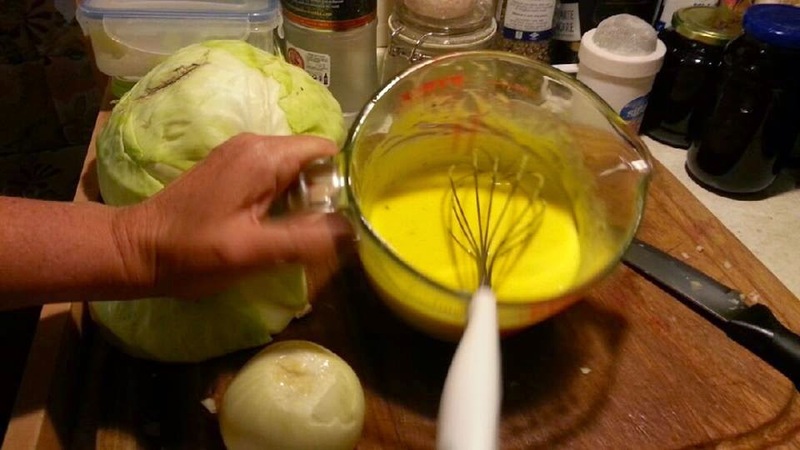 Cob adventures part – lost count! After the sagging incident we spent a week lighting small fires in the oven to harden it off inside. We cut out some of the sagged cob to ensure the door still fit and then made another batch of cob, this time with straw. This time it took just an hour or so to make the cob and layer it on. The weather has been so perfect for cobbing that the east, south and west sides were dry by the end of that same day. 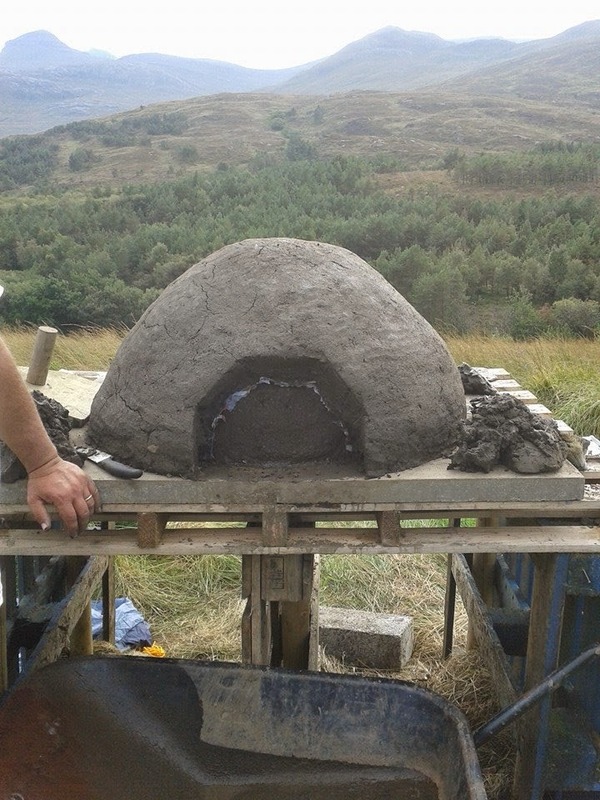 We filled in the slightly dented north facing side and then had another few days of small fires to bake off the inside. By Friday we decided it was time to test it out. So, pizza dough rolled super thin, fire lit for about 90 minutes until the outside of the oven felt warm to touch and the inside felt too hot to put your hand near for more than a few moment. We decided to push the ashes to the sides of the inside of the oven although you could scoop them out instead. We had already checked that our door opening was wide enough for our pizza trays. 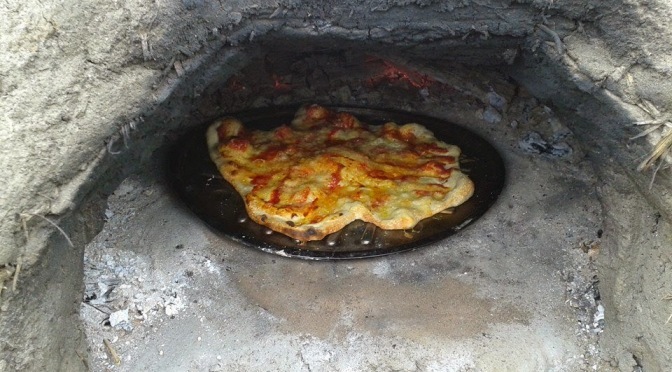 Pizzas cooked in about two minutes – the whole thin pizza bubbles and the edges brown slightly giving a real stone baked flavour and texture to the pizza. We scoffed two pizzas between the four of us and they were divine. 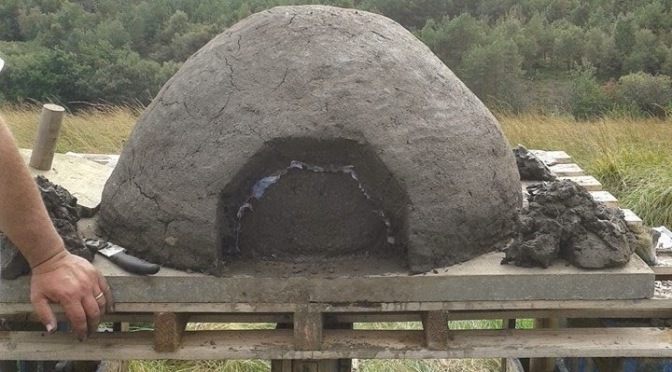 Next we want to create a lime render to the oven, it will look nicer as a finish but also provide a waterproof coat to protect the cob. We could try and create a roof but a lot of the Rum rain falls horizontally! We could put a tarp over it when not in use but it is windy here so that may prove tricky to keep in place. We also want to build a table for constructing and serving pizzas and maybe clad the outside of the pallets to make it look nicer. Mostly though we just plan to make lots more pizzas! Long ago, in the olden days of social media I used to read a fair few blogs every day. Back then I either actually knew the bloggers in real life or knew them well enough online that they felt like actual friends anyway. These days the internet is awash with blogs and my own online time is seriously curtailed so my blog reading is rationed. I have been tagged by Kirsty at Untrapped Life in this blog hop about writing styles and she rather greedily already tagged two people I would probably have tagged – Jax and Merry so I can’t tag them. I have mentioned Kirsty and her traveling adventures with her family and coaching podcasts before – if you have not already checked out her travel blog and untrapped life website please do so – Kirsty and I have definitely supported, encouraged and inspired each other over the years and continue to do so. Writing wise, obviously, not all the other things I am working on! 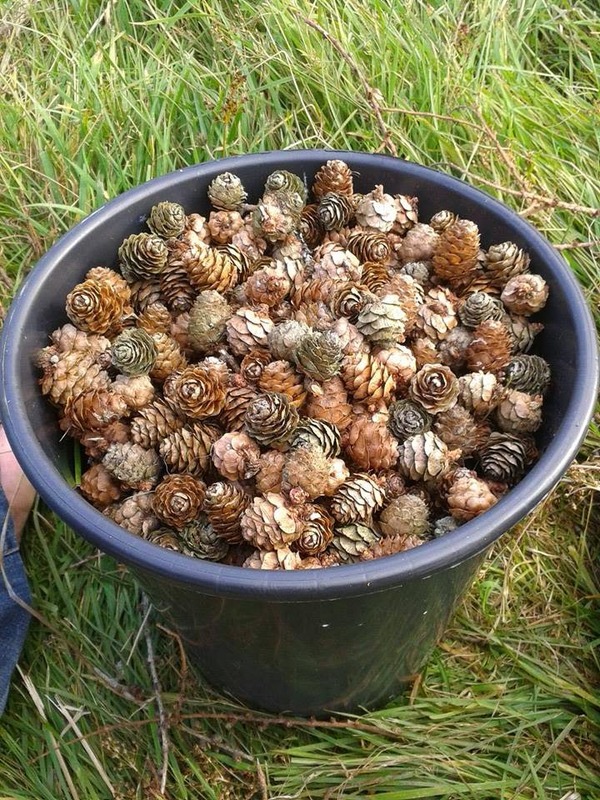 Along with writing this blog I have also written for various other magazines and publications including Scottish Islands Explorer, The Barefoot Diaries, WWOOF UK newsletter. Currently I am working on a couple of articles I hope to submit to some magazines in the permaculture, small holding, self sufficiency area. I write bits and pieces for various local newsletters, magazines and websites too. I am not sure I really have a genre – I write about my life, my hopes and dreams and plans, share a little (with permission) about the rest of our family (husband and our two children). 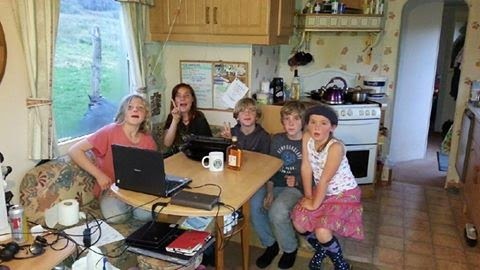 As such it varies from our Home Education adventures, our WWOOFing experiences, life on a remote Scottish Island, crofting, self sufficiency, animal breeding, rearing and processing, crop growing, permaculture, off grid low impact living, dream building, a bit alternative craziness! I hope my writing reflects who I am – humorous, adventurous, passionate, individual. I’d like to reply to this in a really worthy way and say that I keep the blog so that friends and family can keep up with what we are doing, living so far away in such a remote place. Or that I hope to inspire and educate and inform others of the things I am passionate about – family, low impact living, chasing dreams, living life to the full. The truth is that although I do write for all of these reasons the main drive behind my writing is that I have always written and simply can’t help myself. If I am not actually writing or typing I am mentally compiling what I will write or type when I am next sitting down with pen and paper or a laptop keyboard. From a very young age I kept a diary, I have always written stories and poems and spewed words out. If I am not talking I am writing. As above – a constant round of words whirling around desperate to get out and either be spoken aloud, typed onto a blog post or written on a page. I write best at night, alone, with silence and candlelight. I struggle with noise or distractions, rarely edit and generally exhaust myself with committing all I wanted to say to a space outside of me before I am ready to go to bed knowing I have concluded my day. I started this post talking about how I only used to read blogs of people I knew in real life. Actually now I have thought about the three writers I am going to mention it turns out I do know all of them in real life anyway. Allie another used-to-be-local-to-me Home Educator. Allie is one of the most talented writers I know of both fact and fiction. Her rousing blog posts on a variety of topics from parenting to politics to Home Education used to make me want to paint a banner on an old sheet and march along behind her chanting. Allie shares some of her fantastic (and prize winning!) fiction here. Aida is, you guessed it, another wonderful woman I met through Home Ed down in Sussex. She has a huge family of the most gorgeous and super talented children, runs an inspirational and very successful business and is a screamingly funny writer and teller of great truths. Her writings are all grouped together under her business website at Whipped and Baked where all of the content is worth reading (and the cakes worth traveling to taste if you are ever anywhere near close to Chichester!). We are enjoying the indian summer – anything which prolongs the sunshine is good by me. Tomatoes are ripening daily and I made my first batch of chutney today, brambles are still being picking although I have now used up all my jars so am freezing them for later use (I have over 50 jars of bramble jam – a full range of flavours including bramble & lavender, rosemary, ginger, chilli, mulled spices, apple). We have had so many visitors this summer, waving goodbye to one lot and saying hello to the next, often without any break inbetween. It has been lovely – we are all too aware of the time and money costs to come and visit us and our own ties to Rum mean we do not get off to visit others. We certainly have not been lonely for company this summer. We still have two more sets of family and friends planned in for the next few weeks and then we will be just the four of us again. Davies celebrated his 14th birthday and Ady and I our 15th wedding anniversary last week – looking at wedding day photos and baby pictures reminds us once more how time slips away so fast. 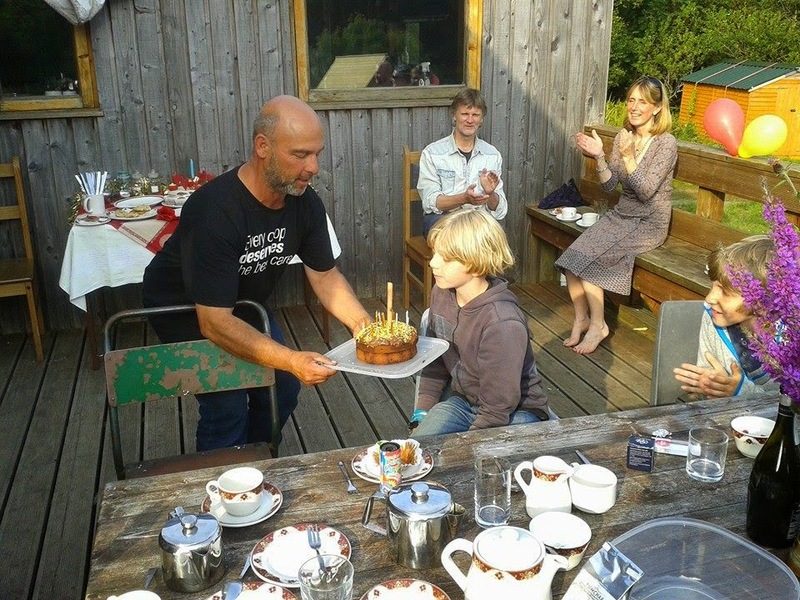 Davies has now had 3 birthdays here on Rum. Having pledged to do our very best to make life here work we have carried on with our workload while having people here, often enrolling their assistance to make things happen faster. 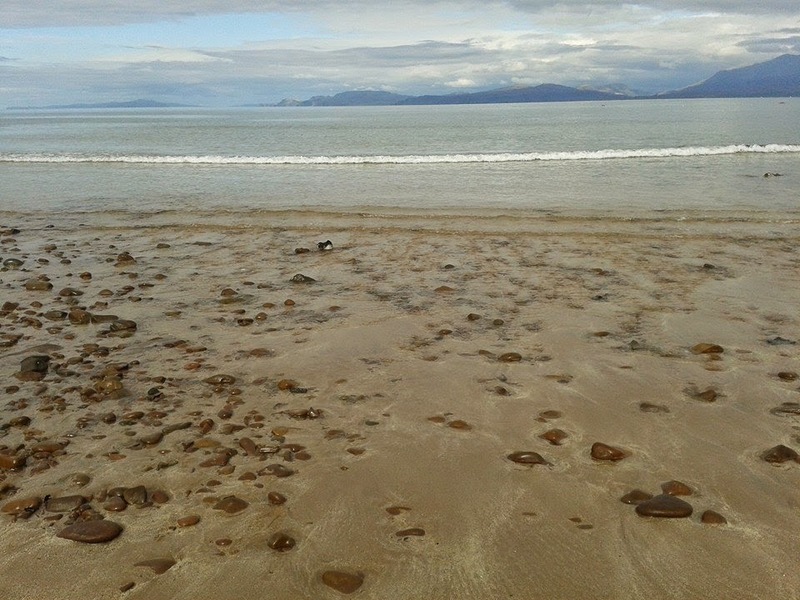 We have also been enjoying the island with friends too though – the children have been on many adventures and exploring expeditions and yesterday we all walked in a big group over to the other side of the island to the sandy beaches of Kilmory where we had a sandy picnic and some of us swam in the sea! 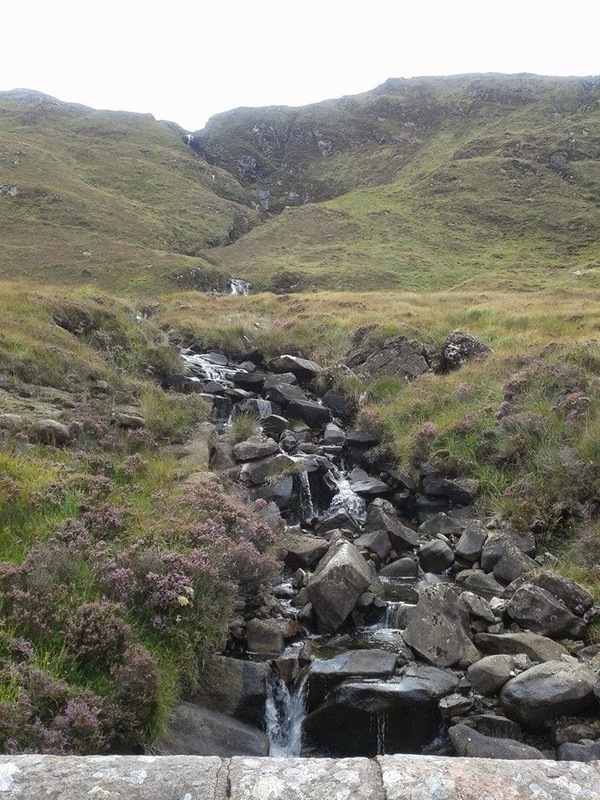 Rum is such a charming place to be at this time of year – the peak of the tourist visitors has passed, the midges have more or less gone, the colours of the landscape are at their most stunning – all purples, greens and golds, the foraging bounty is plentiful and the red deer rut is about to start. 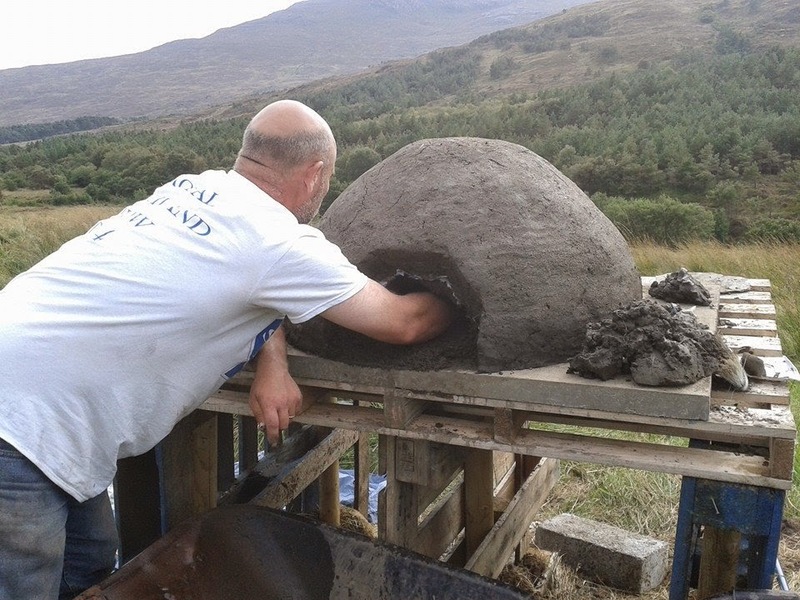 another day, another layer of cob on the pizza oven! Don’t worry, the blog is not about to go X rated.. I’m talking about nature. We are often asked what bought us here to Rum. Infact Ady and I have been asked at least three times just this week. We have varying answers to the question depending on how long the person has available to stand and listen to us but part of the long and short answer is that we wanted to live somewhere beautiful. My Dad tells me often ‘you can’t live on a view’ and he is right, although we do quite literally live *on* a view but it is the nature of Rum which makes it beautiful. The flora and fauna, the wildlife, the weather, the geology, the elements, the landscape. That is why we live here. I cannot wax lyrical and litter facebook with photos of deer wandering majestically past my bedroom window, keeping me awake during the rut with their roaring and still exciting me every time I catch a glimpse of red through the trees as I walk home from the village but then complain about the deer eating my fruit trees and leaving deer poo all over the croft for Bonnie to roll in. It would not be on to complain about the eagles which soar over the croft, create an air of hush and have all our birds stand to attention, head cocked to one side as they eye it flying overhead, likely looking over our livestock to see if there is anything they fancy for dinner. Not when those same eagles bring tourists walking past our croft buying our produce, giving us wonderful photo opportunities and reminding us once more of how lucky we are to live here. In line with this philosophy and taking into account what we have learned about permaculture we are always looking for ways to embrace nature and what happens here on Rum and on our croft naturally to coexist with the wild and maybe allow it to support us too. Having attempted battling with nature and even just trying to tame it a wee bit over the last 2 and a half years we have concluded that at best you can maybe harness it to have the wild on your side. 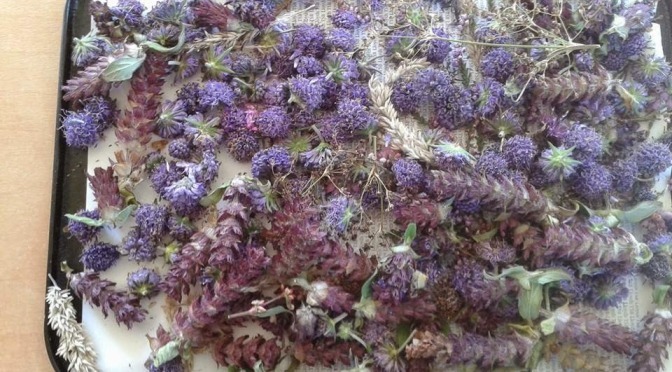 Foraging wild food is better than breaking your back weeding, watering and trying to force things to grow in inhospitable conditions – better to find a use for the weeds! Introducing breeds of animal here which struggle with the conditions, have to have expensive food brought in and require lots of looking after will never trump the fish which swim in the rivers and seas and the wild deer which roam the island. Better skills than animal husbandry are fishing, butchering and 101 ways with venison! This is not to say that we will be giving up growing food in our walled garden, fruit cage, polytunnel, herb spiral. Or that our current livestock holding is at risk – merely that we intend using precious resources of time, money and energy on maximising what is here already. 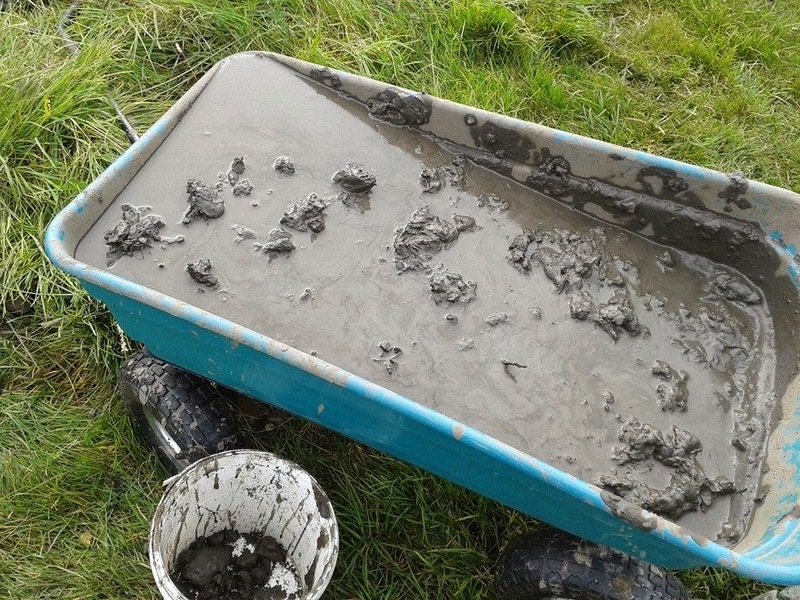 Using the clay and sand on and around the croft for building materials, harnessing the power in the sun, wind and water for our own energy needs, foraging, fishing and gathering food. The plans for the coming months and years are starting to take shape making the most of what Rum has to offer naturally rather than trying to bend and shape it to our own preconceived ideals. The most recent example of this is a new product I am hoping to sell next year at market days, from the croft gate and maybe online through the croft 3 website. The idea came to me a few weeks ago while noticing the beautiful wild flowers on the croft. This year we have seen a massive increase in the ragwort and other ‘weeds’ on Croft 3. A bit of research suggests this is evidence of us being here – animals creating bare patches of earth which allow seeds to take root, us and the livestock carrying seeds around the croft on our feed, in birds droppings. 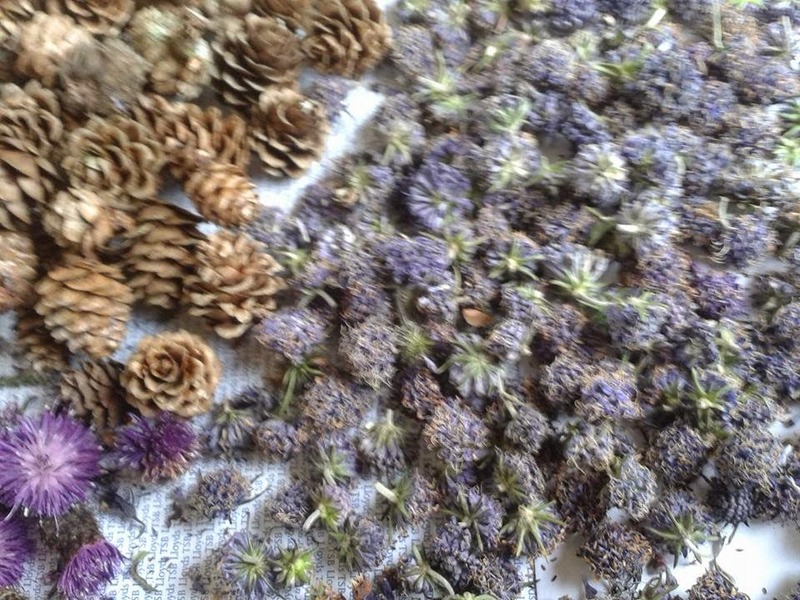 We have been enjoying picking small amounts to bring indoors, spent time identifying them from our wild flower field guide books, had them in glass jars to decorate the static and bring a little of the outdoors indoors. 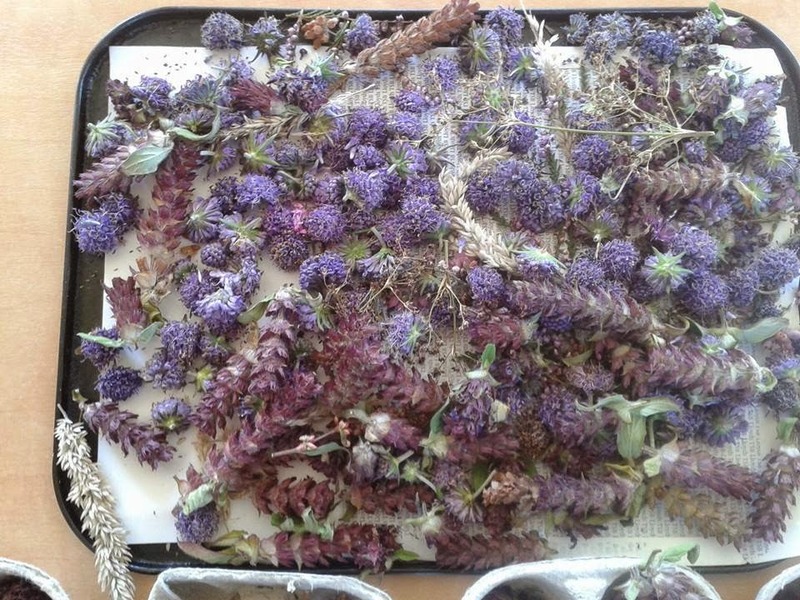 I noticed that some of them dry really well and started to experiment with bringing in larger numbers to dry out and mix together. 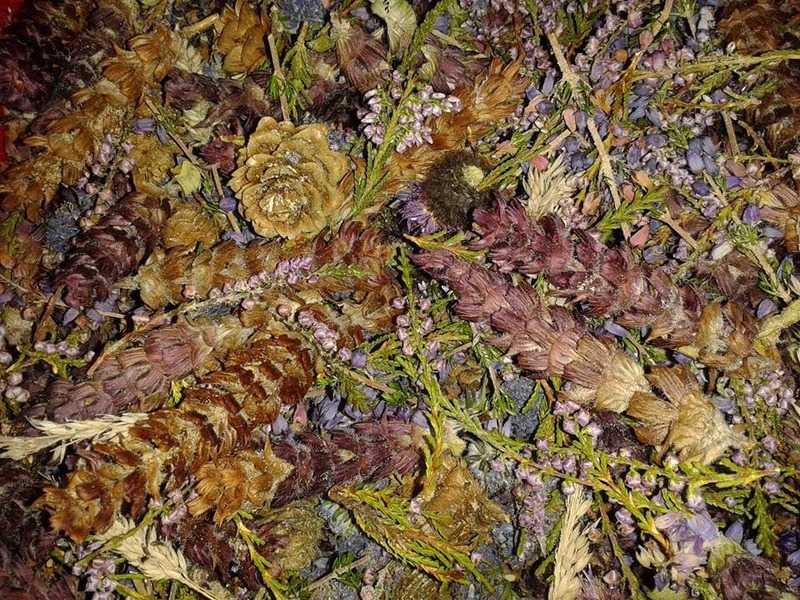 It was a small leap from there to ordering orris root to preserve, some pretty tartan ribbon and bags and suddenly we have several large containers of dried heather, devils bit scabious, pine cones, thistles, clovers and pretty grasses all drying out, absorbing suitable fragrances and being stored ready to package up and sell next year as autumn on Rum pot pouri – ready for people to take a little bag of the colours of Rum home with them. Nature poses many challenges to those who live here. It also provides, nurtures, inspires, delights. I’m pledging to learn to live with nature and to love it. To try and remember, whenever possible to stop trying to fight it. We made a door, based on more mathematical workings out we knew based on the radius and height of our pizza oven what width and height the door needed to be. I had checked that a pizza tray would fit through that gap and looked at my bread tins too. We had found an old mortar board which we thought would make a perfect door so cut that down to size and then drew round it it make a paper template. We then used that to cut around into the cob to create the door. This is actually far scarier than it sounds – it involved cutting a hole into our carefully constructed cob dome and removing part of it. 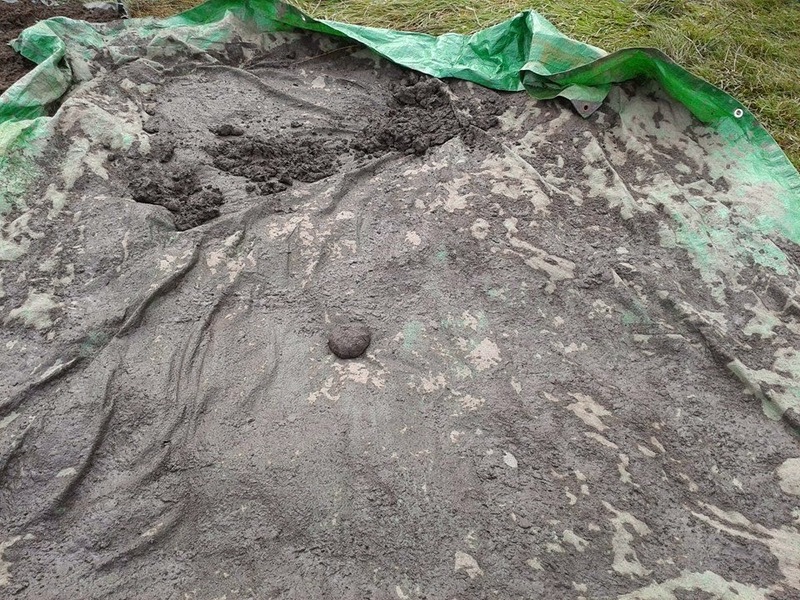 You can’t wait for it to be properly dried out as a) it would be a real bugger to cut through inches of fully dried out cob and b) it won’t properly dry out all the time it is filled with three wheelbarrow loads of wet sand. Well not in my lifetime anyway. Next we checked the door fitted in place. It did. This was good. Next, according to all our books and internet research we had to scoop out the wet sand from the middle. All a bit ‘moment of truth’. 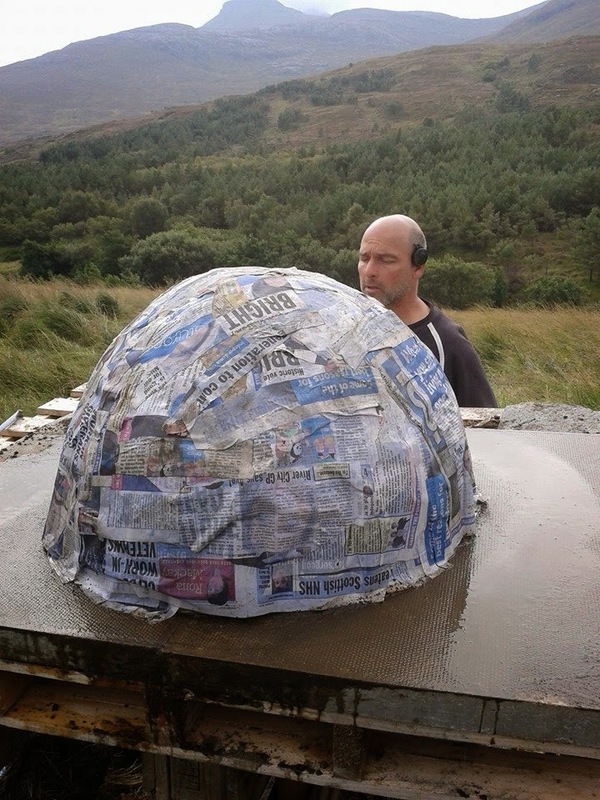 Scoop until you hit the newspaper around the outside of the sand leaving only the outer layer of cob. It was a lot of sand. It took a while. This is where we learned our lessons. What we should have done is either – scoop out quick and then put the door in to assist in propping up the doorway hole. Or leave the sand in for a longer period once the door was cut out. Or – my personal favourite not cut the door hole into the north facing side of the pizza oven which never gets the sun shining on it and so therefore does not dry out and means the wind is not getting blown in and the oven is not drying from the inside out either as the entrance is both sheltered and in shade. The consequence? A slightly dented dome where the cob has slipped a little and is no longer quite big enough for the door to go in. The options to remedy the situation? 1. Pull it all down and start again heeding the knowledge that hindsight has granted us and moving the door to the east or south facing side. 2. Hope it dried out soon and then trim off the excess so the door fits and maybe simply for aesthetic reasons fill in the slight dent with some more cob – it will mean that inside we have a slightly non-domed bit but I am fairly sure this will not impact adversely on the cooking quality of the oven and from the outside no one need ever know. At the moment we are planning on going for the second option – Fingers crossed it continues to dry out and we are able to do that fairly soon. We may try and light a small fire in there to assist with the drying out process. 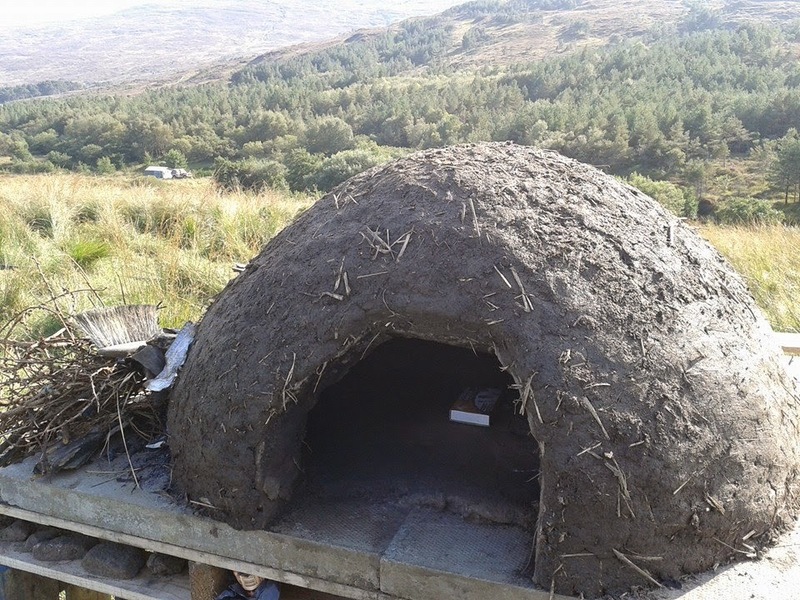 I have wanted to build a cob or earth oven ever since we went WWOOFing – no less than three of our WWOOF hosts had one in various guises and building our own has been on our to do list pretty much since we arrived here on Rum. 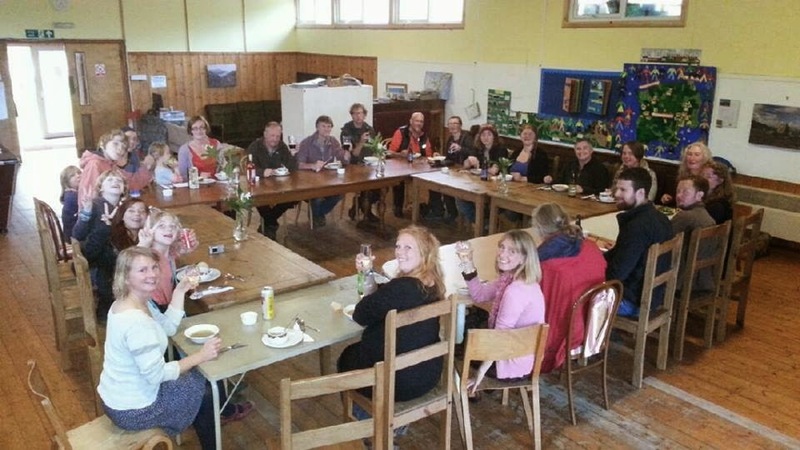 After we went on our cob course in May this year it moved closer to the top of the list but like so many things here the reality of making it actually happen was far harder than just intending to do so. But it is now built! It needs to dry out, the door needs to be creating, cut out and fitted, the surround needs some aesthetic finishings and as yet it is all still very experimental but I thought I’d share where we have got to so far nonetheless. 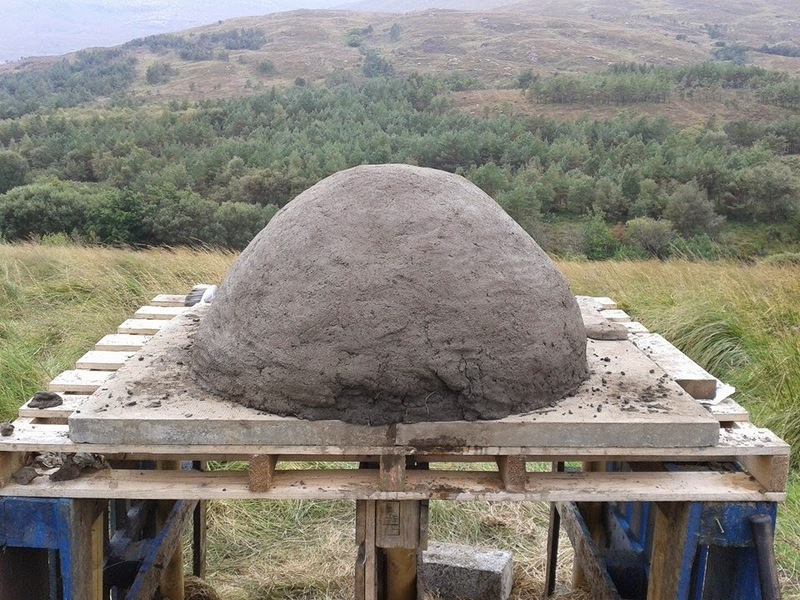 Our cob mix is made from clay dug from the croft. 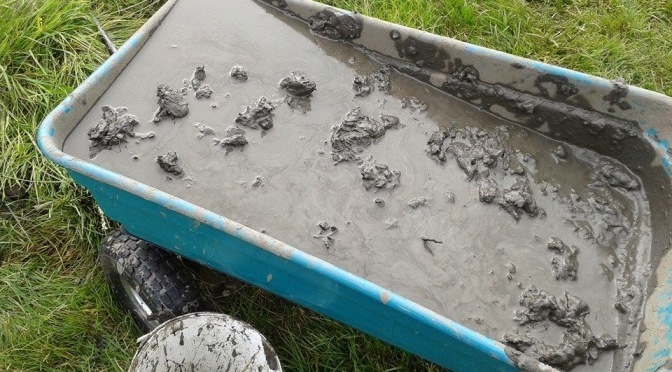 We have pockets of clay under the top soil in various places, having dug about 20 test holes over the 8 acres we have struck clay in sufficient areas for us to feel confident of having enough for an eventual house build. As ever we try to ensure we are meeting as many objectives as possible with every action we take so simply digging a hole without a plan for said hole is not really an option. 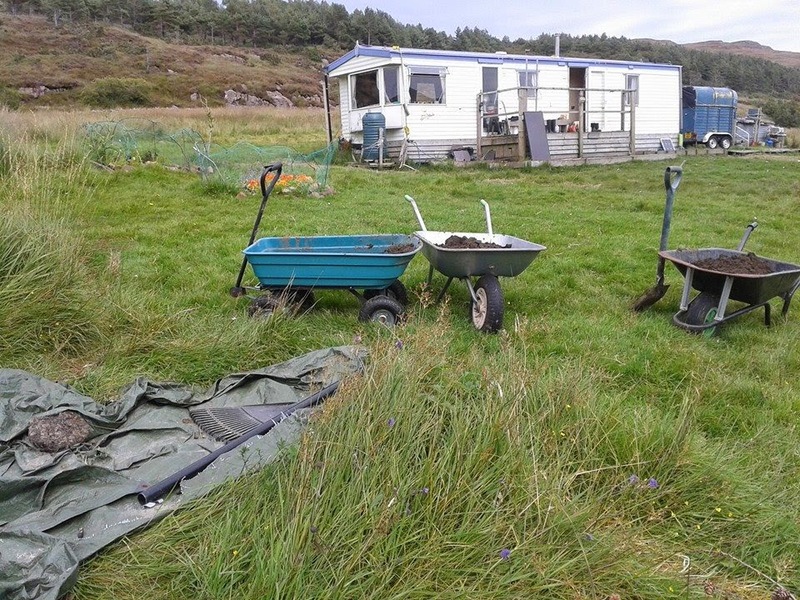 There are always drainage ditches required to improve the croft, we may at some point want some terraces dug but this time we had a need to deal with a larger than usual supply of human waste thanks to a lot of visitors staying with us and less sunshine and heat to aid the composting ability of our loo. Winning – a hole to excavate clay becomes a pit to bury some not quite composted humanure to complete it’s process in the ground. 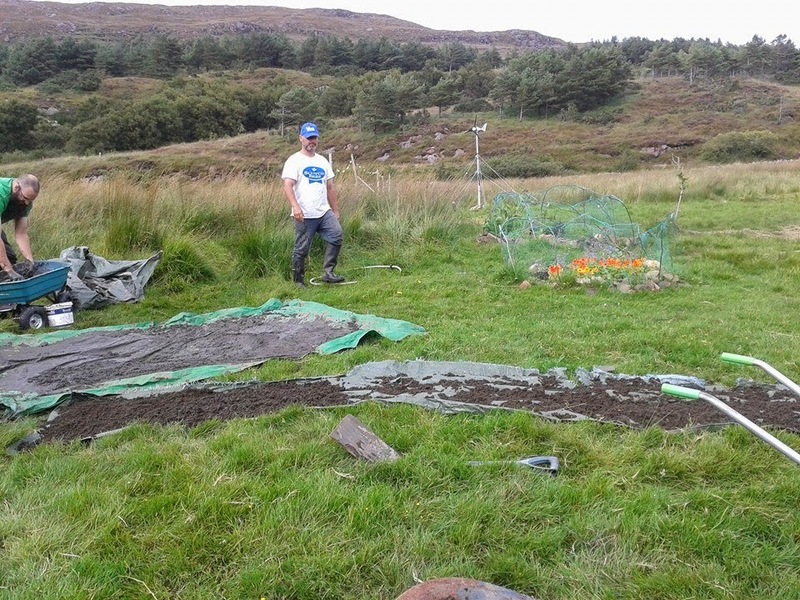 The sand component was equally easy – where the river floods in high rainfall periods part of the river bank is being eroded away, creating less spaces for riverbank nesting birds and presenting a long term problem for flooding the lower end of the croft and the nature trail which goes around the croft perimeter. So a bit of digging out of the sand to assist in the river flowing away better was also no bad thing. 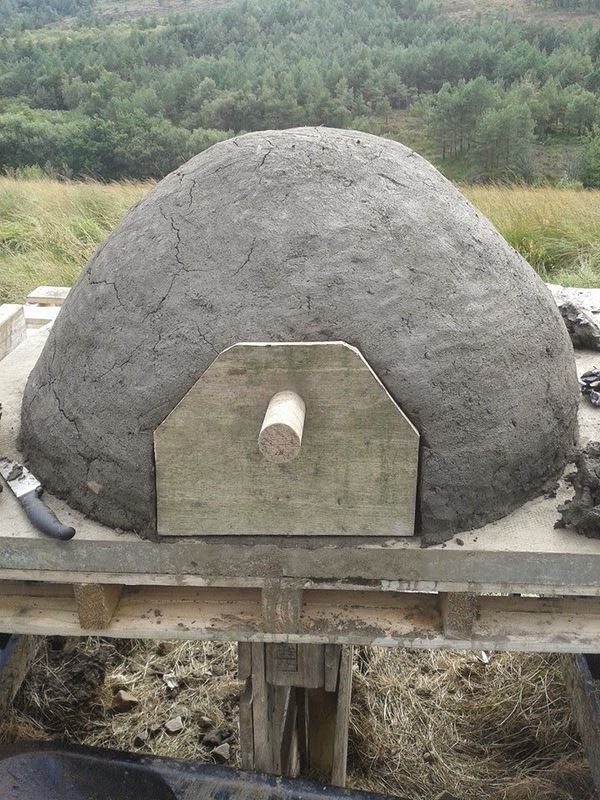 So a couple of days collecting clay to soak in a pit and have small stones sifted out by hand, barrowing up a few wheelbarrow loads of sand and spreading it out to dry, mixing the correct quantities of both together on a tarp by way of the cob dance and we had the first batches of Croft 3 cob ready to go. 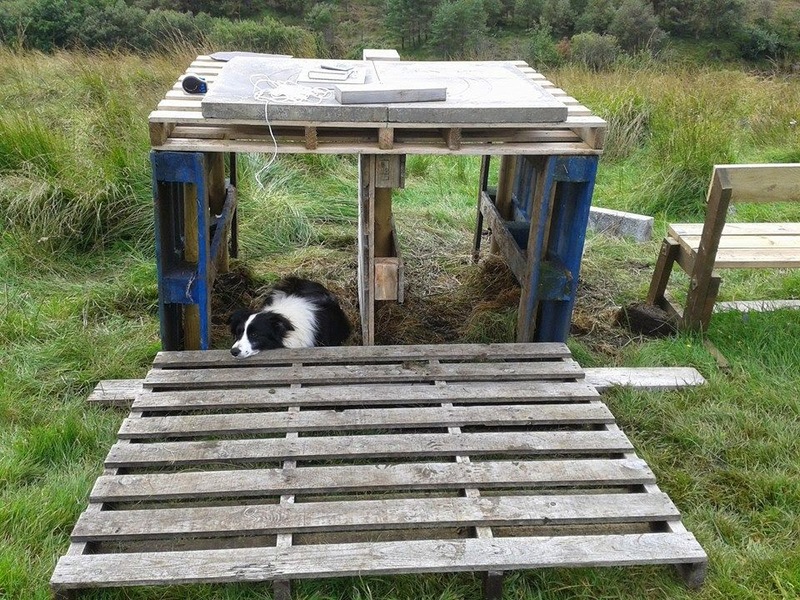 The base of the pizza oven is four reclaimed pallets, kindly sent to us by the ferry company who have an excess of them kicking around at the pier on the mainland and are only too happy to stick them on the boat. We also get animal feed deliveries often stacked on pallets. Topped with some paving slabs which were long since left over on a job on the island and were spares we were gifted for our project we had our base. Eventually we will fill the cavities with firewood ready to burn to cook from and make the sides more decorative but for now I quite like the cobbled together ramshackle feel of the base. 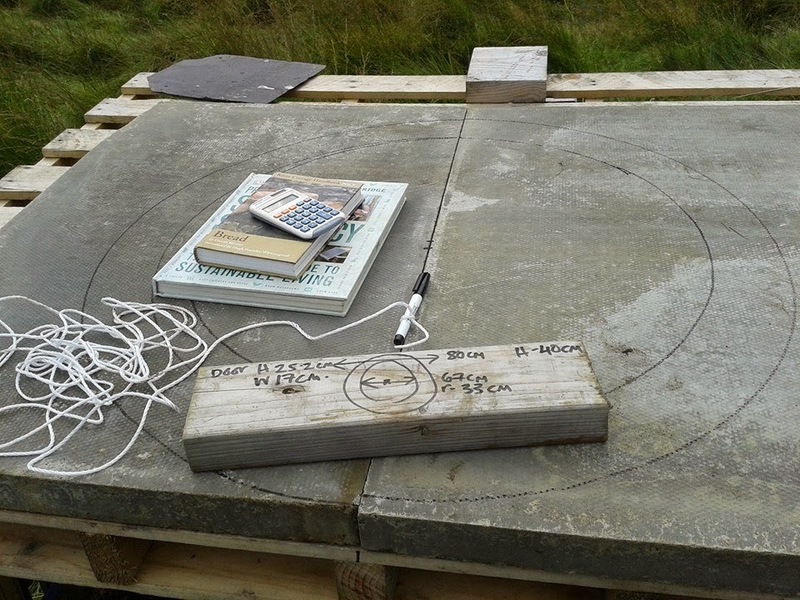 Next came the science bit – it required precision tools, mathematical equations, tape measures and a pencil tied to a bit of string! technical tool and no sign of a safety net! There were words like radius, diameter and the need to draw circles, do maths and keep notes of various numbers. 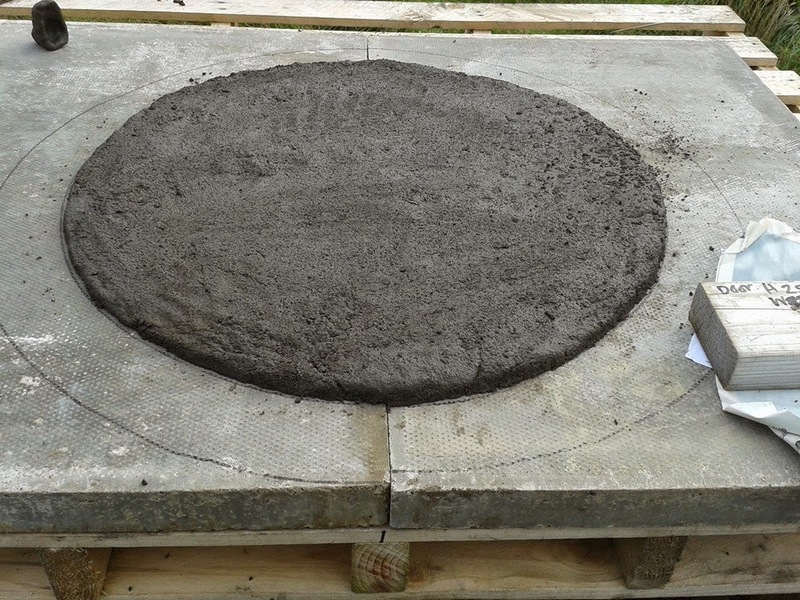 First of all a perfect circle of a thin layer of cob to be the base of the oven. We left this to dry out really well for two days after which it was as hard as concrete. 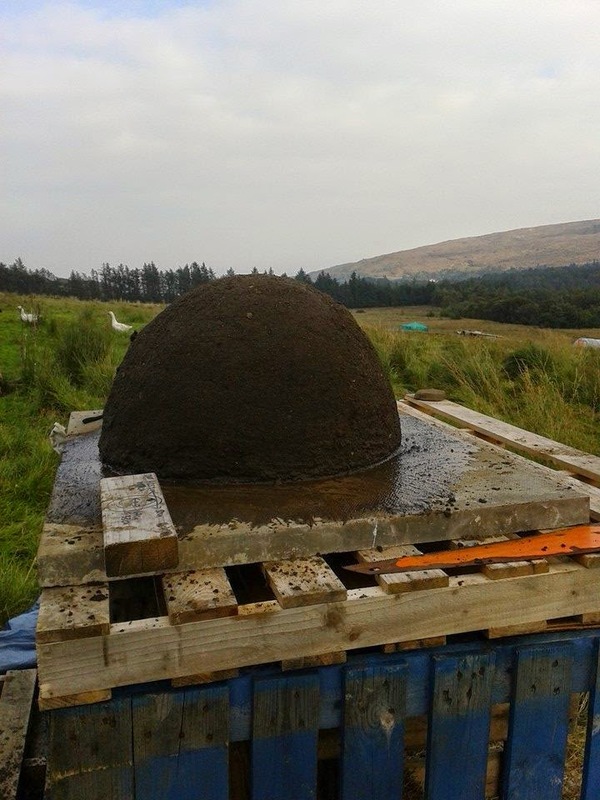 Next came the sand former – a dome shaped sandcastle ready to be the internal support for the cob while it dries out sufficiently to become self supporting. Next – and I would dearly love to gloss over this part as I failed utterly miserably at making it happen, battling with torn off strips of newspaper, shouting at the wind, having bits blown away and chased by ducks. Ady however, is master of all I stumble over and came in and made a perfectly domed cap of paper in an effortless fashion. eagle eyed folk will spot the papers are literature from the Yes! campaign for Scottish independence. Finally it was cob o’clock and in just a couple of hours we had a cob covered dome which is now nestled under an old tent to dry off a bit. Tomorrow we face daring deeds such as cutting out the door shape and scooping out the sand. Again without a safety net. We do like to live dangerously! 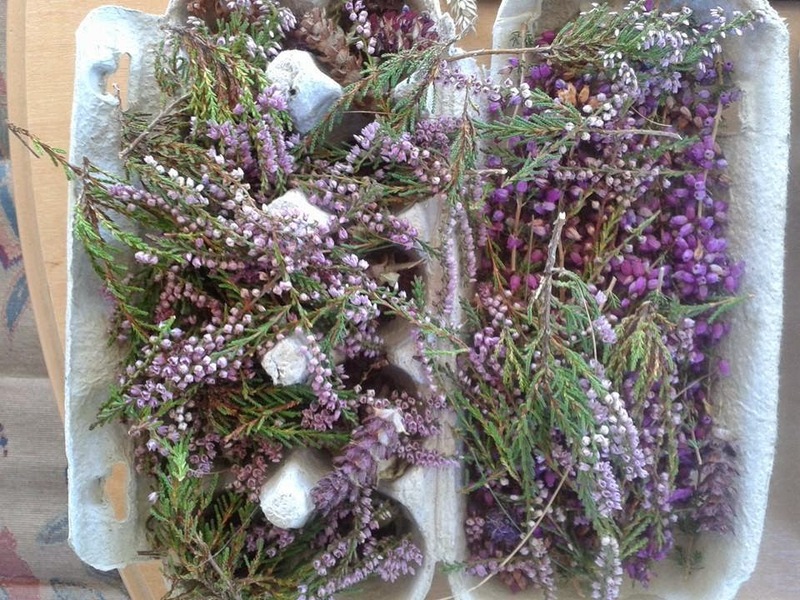 We’ve been all about the friends and family staying, the foraging and preserving, the drying and storing, the harvesting and celebrating. 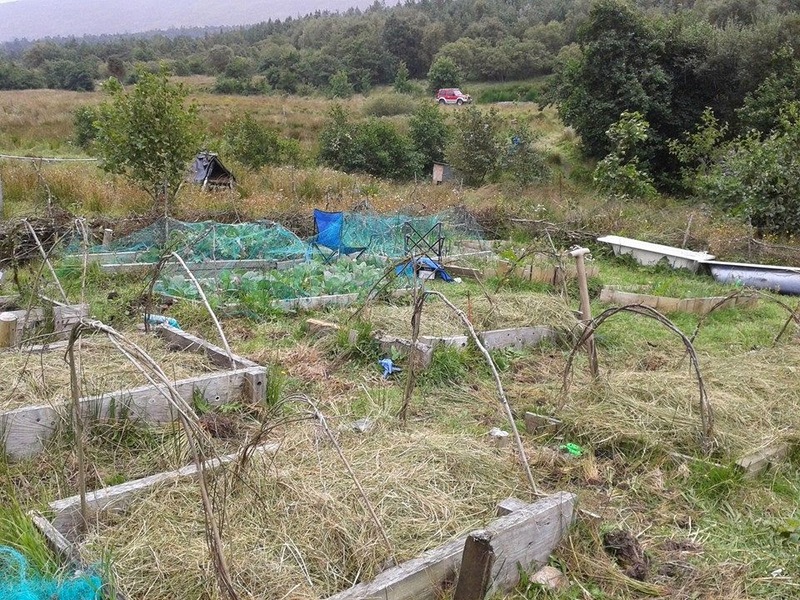 Not pictured but very much keeping us going is bramble picking and jam making (50 jars so far and counting), harvesting tomatoes and cucumbers from the polytunnel, plenty of scything and drying out the cuttings for animal bedding and using as mulch on the raised beds.